This week the team at Hog Roast Appleton were once again presented with an opportunity to give something back to the community. We were contacted by a man named Jamie, somebody who has hired us to cater for charity events in the past. After such a successful night raising money for terminally ill children, he was this time organising a charity football match to be played out by two semi-professional sides, in order to raise money and awareness for Prostate and Ovarian Cancer. Fans and spectators would be charged five pound for admission to the match, and would be able to grab something to eat from us once they were inside. 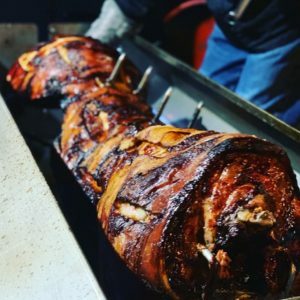 It was a twelve o’clock kick off, so the team from Hog Roast Appleton had to be at the small stadium that was hosting the match, for eight o’clock in the morning, in order to butcher the hog and put it on the spit for roasting. We set up a Gazebo near the front entrance, as well as a serving table for sauces and bread rolls, paper plates and napkins. Our hog was to be served as our famous pigs in buns. When kick off came, many of the spectators missed the opening ten minutes, as they were too busy queuing for our top quality cuisine, which had tempted half of the stadium with its wonderful aroma. But as the half wore on, the crowd slowly got into the spirit of the game, and the action on the pitch intensified. Meanwhile the team from Hog Roast Appleton were also busy preparing a surprise round of desserts for everyone – Handmade, individual cheesecakes – whilst simultaneously serving pigs in buns to guests. The desserts were handed out at half time, and many of the guests were once again blown away by just how tasty they were! The charity match was a huge success that raised well over one thousand pounds, which would be split fifty-fifty and sent to Ovarian and Prostate Cancer Charity organisations respectively. With nothing else left to do the team from Hog Roast Appleton tidied away their mess discreetly and left the fans to enjoy the game. Hog Roaster Hire In Nantwich! Hog Roast Wedding Catering In Nantwich! Hog Roast Machine Factory Visit!